In a city where we take our babies to Jazz Fest when they’re still in strollers and dance in the street with them during Mardi Gras, it should come as no surprise that New Orleans parents appreciate having a good time with their kids. Fun-loving families have a fantastic new option when they decide to hit the town with the opening of the new Fulton Alley. Located in the Warehouse District between Fulton Street and Convention Center Boulevard, this bowling alley opened in the winter of 2013 after an extensive and gorgeous renovation of the space. Described to me by friends as “boutique bowling,” I realized after my first experience there that the description was a perfect one. The bowling alley is smaller than bigger chain bowling alleys and definitely has a more upscale feel, but with its large black leather sofas and plastic cups with lids, it’s still very kid-friendly. 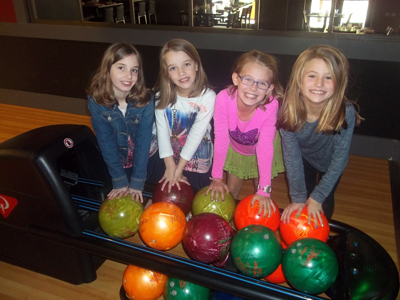 My kids always have a great time bowling and seem to suffer from cabin fever quicker than most, so on a recent Saturday afternoon, we decided to get out of the house and go check out Fulton Alley with good friends the Boughtons and the DeMarcays. When you first walk in, you may be tempted to immediately start your check-in process at the desk, but make sure you take a minute to notice the wonderful architectural details all around you. The exposed brick, reclaimed bargeboard and black wrought iron give Fulton Alley its uniquely casual but sophisticated flare. You will also notice the impressive art – all by local artists. It is nearly impossible to believe that the space was previously used as a bus barn and part of the parking garage in the Harrah’s Casino complex. We were shown to our lanes and asked to fill out a quick form with our bowlers’ names and shoe sizes. The lanes can be rented by the half-hour with a one hour minimum, and there’s a limit of six bowlers per lane. Then, as if they somehow knew how long it takes and how many times I typically have to hit the “Clear” button on the traditional bowling scoring computers, our names instantly appeared on the large screens above our lanes. It is part of the protocol at Fulton Alley that the names are entered by the host behind the front desk. A minute later, large wire baskets with our bowling shoes were delivered to our lanes. The form we filled out also allowed us to indicate which individual bowlers wanted the “bumpers” up when they bowled. The bumpers would then automatically go up and down depending on who was next to bowl. What a plus when bowling with kids! I thought we had seen the best of what Fulton Alley had to offer as I watched the group bowl, cheer for each other and laugh, until I saw the menu. It wouldn’t be a true New Orleans venue if food weren’t a key player, and in this case, the food deserves as much of the spotlight as any other aspect of our experience. The menu consists of a wide selection of small plate and dessert options. Our group decided to try quite a few, and enjoyed the pimento cheese with toasted brioche, deviled eggs, waffle chips with onion dip, beef sliders, smoked chicken wings, french fries, and the surprise hit of the day with all age groups, flash-fried Brussels sprouts with pepper jelly. Everything is made in-house and it shows. Rarely, if ever, on a day out with the kids have the adults eaten quite so well. The bar is impressive both in its physical size and its vast menu, offering a great beer and wine selection as well as many signature cocktails. There are also, of course, the typical soft drink offerings as well. With everyone in the group able to claim their fair share of strikes and spares, we took the last bites of our food, returned our shoes and headed home. This had been one afternoon out with the kids that I feel certain the adults enjoyed as much, if not even more, than the junior crew. While Fulton Alley is open seven days a week, it’s important to note that children are welcomed specifically on Saturdays and Sundays from 11 a.m. until 6 p.m. For more information, prices, menus and reservation details, visit FultonAlley.com.